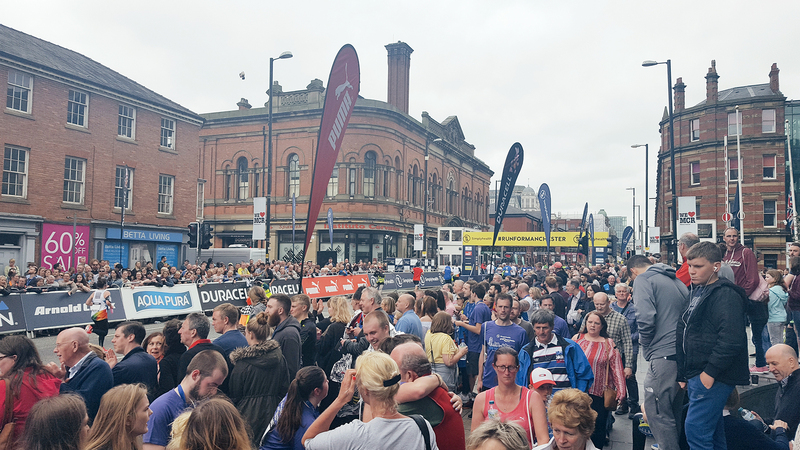 The Great Manchester Run. An incredible event, and one I always love doing/watching. 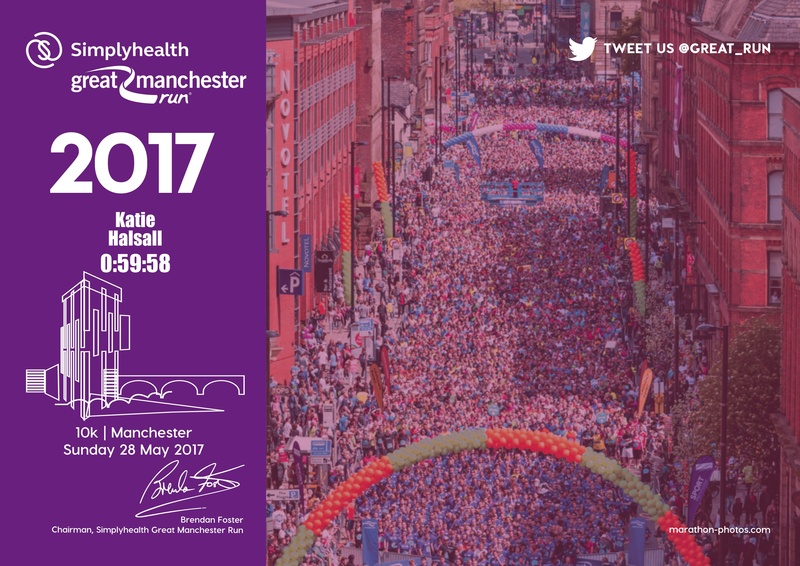 Thousands travel to Manchester for it, and of course we have the elites races to start the day off. This year was a little different. We weren’t 100% sure it would go on thanks to what happened on the 22nd, that awful tragedy. But it did, and oh boy did we turn out. I really didn’t know what to expect for the day if I’m honest. Would it be quiet, and eerie? Would I feel scared or unsafe? Would the atmosphere just be completely different to usual? Well, for one, not once did I feel safe in the streets of Manchester. We did have armed police dotted around everywhere and I don’t know what it was exactly, but it just felt good. Emotional, but for all the right reasons. It definitely wasn’t quiet, that’s for sure! When we first arrived the finish line area was pretty quiet as everyone was congregation near the charity village and starting line areas. The support as I was waiting in the starting pen was phenomenal. So many people around the edges cheering us on. By the time I got to the finish, everyone was there instead. Every wave had a minutes silence for those who sadly lost their lives in the bombing attack, and Tony Walsh read out a poem. I’ve never had a poem touch me so strongly, and I had tears in my eyes listening to this just before starting. It isn’t a new one, but it was definitely very fitting for this year’s race. I’ve embedded it below, please listen! I don’t know whether it’s the wave I was in (I was in blue with the 3000 Manchester University purple wave…) but it was SO busy. I felt like I constantly had around 20 people super close to me, and had to keep weaving in and out. Like to be honest, it isn’t the end of the world. I was hoping for a PB in this race but I wasn’t taking it super seriously. I was just happy that it did go ahead and we all turned up. But oh damn, it was tough. We didn’t have any sunshine, but I think it was around 17 degrees so you know, it was warm. The air was still pretty humid too so all that makes for a tougher run. Thankfully there were two shower tunnels on the route… Freezing cold water spraying down in a mist to cool you down. Genius idea. 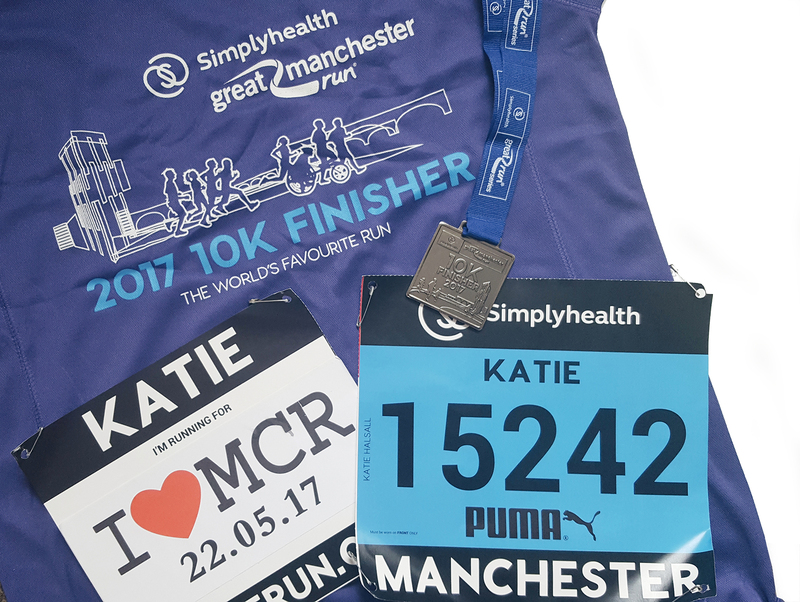 One of the best things about the Great Manchester Run is the support you get on course. So many people turn out. 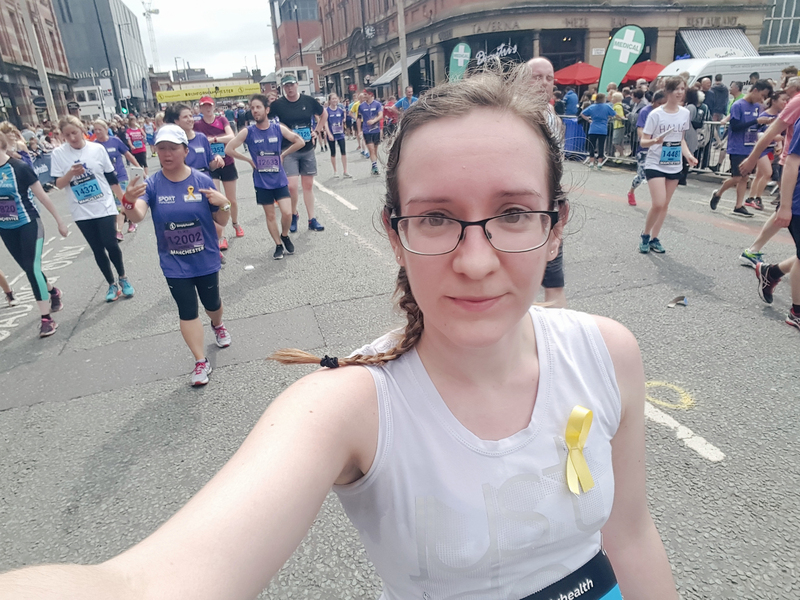 The last kilometre just before you get to the corner of Deansgate has to be one of my favourite parts ever, I mean for one it’s downhill… Thanks to the named bibs though, you get random strangers calling out your name and cheering you on. Hearing that is such a good push. It’s crazy how different the support feels when they are personally calling you by name. Not gonna lie though, that finish was hard. 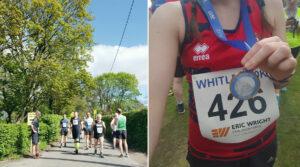 I hadn’t run as well as I have in previous races, but I pushed myself to the end and thankfully still managed a sub-60. There are a few photographers right near the finish and I remember seeing them and thinking right, good finish photo, smile, smile. I really thought I was smiling – turns out I wasn’t and I look like I want to cry haha. So yeah, I finished in 59:58. Not a PB, but the second fastest I’ve run a 10km so I am pleased. The day as a whole was just incredible and I’m amazed at just how many spectators turned up to watch and support us. Manchester is great, and this is a run that’ll always be high on my list. Ever done it? Next challenge – a Race for Life 5k run. Tomorrow in fact! Garmin Forerunner 10 – A review.